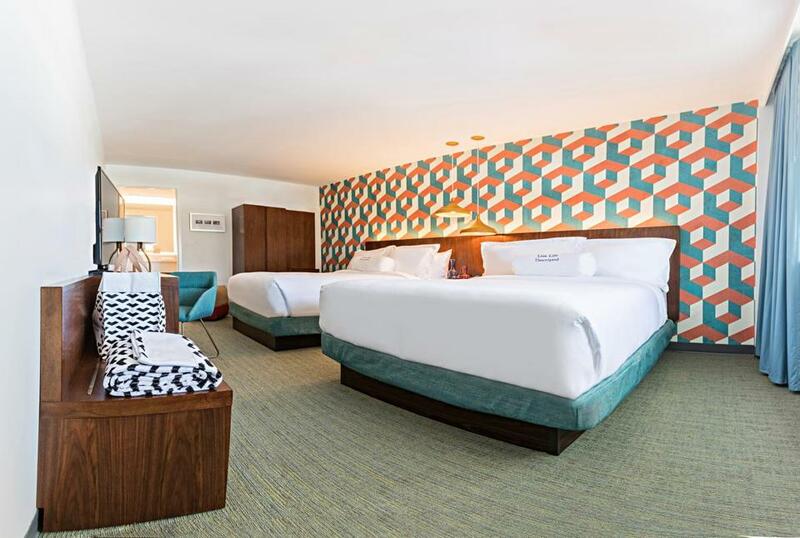 The bedrooms at the Unscripted Durham hotel are filled with fun splashes of color. DURHAM, N.C. — The wildly creative food and brew scene that reenergized this former tobacco town exploded so quickly, lodging couldn’t keep up. That’s finally changed with a trio of boutique hotels within a block of one another in the heart of downtown. The latest arrival, Unscripted Durham, which opened its doors in July, feels like the tireless teenager to its older-but-still-hip siblings, the art-loving 21c Museum Hotel Durham and scene-making The Durham Hotel. The Unscripted, bathed in bright colors, even down to its graffiti-adorned parking garage, places the emphasis on fun. Sometimes I wanted to scream at the teen to “turn the music down!” but mostly I appreciated the energetic vibe. While much of downtown’s renovated buildings were built in the earlier 20th century, the Unscripted sports a thoroughly midcentury modern façade of straight lines, long glass windows, stacked levels, and royal blue paint. It started in 1962 as the Jack Tar Motor Lodge, catering to the new car culture. Several decades later, it had fallen into disrepair, along with much of downtown. Now, the building, after a stunning $19.5 million restoration, is contributing to Durham’s turnaround. The hotel has 74 guestrooms and two clusters of food and drink spots, including a lively third-floor deck with a very small pool that nonetheless compels people to hop aboard its goofy floats. Both “The Studio,” a combination lobby, lounge, and café downstairs and “The Patio,” the pool, bar, and cafe upstairs, are open to the public, so there’s quite a bit of traffic from visitors as well as guests and staff. Although I didn’t see any dogs, they’re allowed up to 25 pounds and even free. My third-floor room, a “City View King,” one size up from the smallest, at about 300 square feet, was at pool level. The doors to both the third- and fourth-floor rooms open to the outside, so if you don’t want to feel like you’re part of the party, especially the Friday night DJ-hosted pool parties or the Monday “The Dive-Inn” flicks, reserve a room on the second floor, which is enclosed and much quieter. I stayed on a Friday night and was disappointed to learn at check-in that the night’s festivities were canceled — until I saw that I would have been in the middle of it all. My room was a smart combination of contemporary and retro design, backed by a bold graphic wallpaper of blue, green, and yellow. The feather bed and goose down pillows were super comfortable and dressed with fine linens, and a multiple of ports and outlets made charging easy. My “city view” was other buildings, including an odd-looking man staring at me from a few floors down that I finally figured out was a lifelike cutout. True to Durham’s locavore reputation, the minibar was stocked with locally sourced offerings. The bathroom was equally luxurious — with a large walk-in shower, plush and plentiful towels, and Jonathan Adler amenities. Two master light switches control bed and bath areas — a trick you need to figure out on your own. The breakfast and café options are tasty, and two restaurants attached to chefs with local followings are opening in the building in the coming months. Already on site is the Pour Taproom, with a wall of 64 self-pour taps of beer (some local and regional), cider, and wine. My visit came within a month of the hotel opening, so I’m hoping some of the snags and service issues I encountered will be worked out. Those include not being able to reach reservations and guest services several times, having my key card deactivated at standard checkout time even though I’d been offered late checkout, finding no one in the café to serve coffee on a Saturday morning, and a parking-fee miscommunication, later resolved. Guests will quickly discover that a stay at the Unscripted allows them to not only visit Durham, but to be a part of the action. If you’re into that, dive right in. UNSCRIPTED DURHAM, 202 N. Corcoran St., Duram, N.C.; 984-329-9500; www.unscriptedhotels.com. Nightly rates range from $169 to $359.